After you place your order, you'll receive a message with a link. Click on "Go to My Downloadable Products" to access your .PDF or PowerPoint. Questions? Call Customer Service at (800) 650-6787. 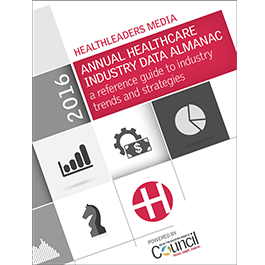 The HealthLeaders Media Annual Healthcare Industry Data Almanac is the latest critical resource needed for your 2017 planning. This collection of data, available in three formats, reveals the strategies peers are using to achieve success in the constantly evolving healthcare industry. Topics are examined in detail, and data is presented in an easy-to-read format based on charts accompanied by concise commentary and analysis. Want to know the average share of net patient revenue for value-based payment models? How about the share of patients in value-based programs? This data, as well as many other critical questions are available in this indispensable report. This Almanac provides a year’s worth of healthcare industry research in one place for your convenience. Discover the data and results behind the most important trends in the industry! Order your copy now. Looking for more information? Click below to download a free sample!